Gabriella Griseta is a defense litigator of personal injury and workers’ compensation matters. She ensures clients are prepared for all aspects of trial. 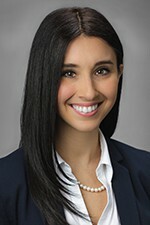 In addition, Gabriella handles all phases of complex litigation including conducting research, drafting pleadings, motions, briefs, discovery depositions and alternative dispute resolutions. She has drafted and filed motions under multiple actionable sections of the Illinois Workers’ Compensation Act, including Penalty Petitions and Petition for Review of Arbitration Decision. Prior to joining Hinshaw, Gabriella was a law clerk with the firm. During law school, she gained a variety of experience clerking for multiple Chicago-based firms—including a plaintiff’s injury firm—and served as a representative on the Dean’s Advisory Council. Outside of work, Gabriella enjoys reading, cooking new recipes, and spending time with her husband, Tom, and their miniature dachshund, Layla.